Striking. There's no other word to describe this necklace. JKAT's Full Moon pendant is lassoed by two cable chain loops. This allows the necklace to be worn two different ways (see inset photos). The Full Moon pendant is solid sterling silver and feels so good against your skin that you'll probably never want to take it off. 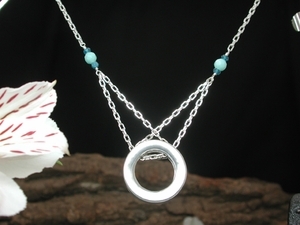 The amazonite & apatite accents really make the silver Moon pop. Clasp anywhere on the chain for your perfect fit. Sterling silver, lobster clasp.